The vanity unit is often a focal point of the design of any bathroom. Freestanding or wall mounted, your choice of vanity should accommodate the type of basin and your space requirements. 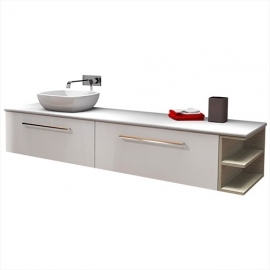 Vanities Please click on images to view our full range. The vanity unit is a critical focal point of the design of any bathroom. Our wall hung ceramic top vanity selections will accommodate any bathroom. You can complement your vanity with a range of other furniture items including our selections of wall hung cabinets. Mirror cabinets provide a discreet storage area behind your mirror. In many cases, the cabinets can be recessed into the wall thus utilising the cavity space and still having the mirror flush with the wall. We offer a diverse range of shaving cabinets in various sizes. The vanity unit is often a critical focal point of the design of any bathroom. Our wall mounted cast marble vanities accommodate any type of bathroom space. You can complement your vanity with a range of other furniture items including our selections of cabinets. What is cast marble? Easy to clean with a high gloss finish. Manufactured from high-grade resin, cast marble is extremely true and does not warp like ceramic products. Heritage Style Vanities with Marble Tops A delicate balance of contemporary aesthetics with a heritage "look & feel" combined with strict quality control in the materials used in in its construction, the Coventry range is the definition of "Creating Elegance". The featured highlight of the Coventry range is use of genuine marble tops. Sourced from Europe, they provide the finesse finishing touch in style and elegance. Mambo slimline tempered glass basin tops are super smooth, with an irresistible soft curving basin. Black is deep glossy and sleek, creating a stunning feature piece in your bathroom.